If you enjoy variety in the comics and stories you like to read, you need to be reading what Cy Dethan writes! This talented scripter from the U.K. has been challenging my thinking for a long time, and I always enjoy that! 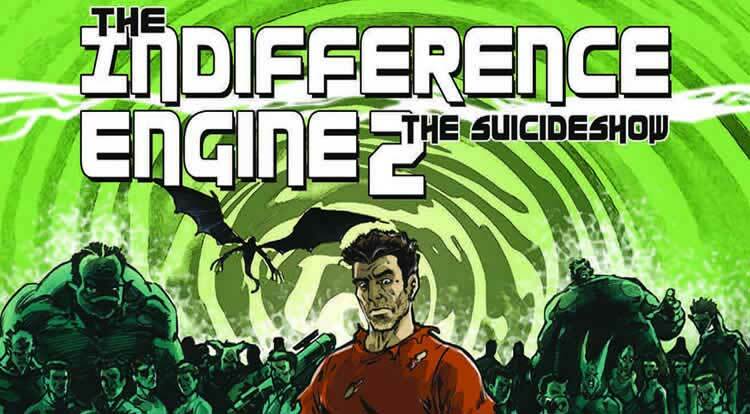 During this 169th episode, I chat with Cy about The Indifference Engine 2: The Suicide Show, the sequel to his successful The Indifference Engine. He’s also written Cancertown: An Inconvenient Tooth and Cancertown: Blasphemous Tumours, White Knuckle and other great stories. To buy his books in paper or digital editions, go to his Author Page on Amazon.com at this link! Either that or check out Markosia’s website to get your copies! Also check out Cy’s website to keep up with what he’s creating! Show your thanks to Major Spoilers for this episode by becoming a Major Spoilers VIP. It will help ensure Wayne’s Comics Podcast continues far into the future! Next week, be sure to listen to my fun interview with Cavan Scott, who’s writing the Titan Comics’ Doctor Who: The Ninth Doctor five-issue miniseries!